INSTANT HELP: Open BookTrakker, go to a section and press F1 to open Context-Sensitive Help. Most, but not all, sections offer this. If you get a message from Microsoft about why Help does not work then follow the instructions to fix. Numeric vs. Alphanumeric: BookTrakker defaults to Numeric mode, where the Rec # field is the same width as the Price field, upper left corner when you open BookTrakker. SKU's are numeric and generated automatically when you do New Record. If you want to create your own SKU's as numbers, numbers and letters, or letters only, then do Tools > Options at the top. About 2/3 of the way down the form that opens is a check box for Use Alpha Record Code. Check the box, restart BookTrakker. The Rec # field is now the same width as the Status and Type field below. When you do New Record you can type in the SKU you want. The display is limited to 16 characters, the actual field length in the database is 50. You can see your Rec # in the large field at the bottom of List View when not in New Record or Edit Record mode. Changing Status, or marking books Sold. Please Email tech support at: mailto:support@booktrakker.com if you have any questions or problems. Please include your name and a phone number. Are your record numbers alphanumeric? Tools > Options > check Use Alpha Record Code. Click OK. Click Yes. Deleting the Sample Database: Tools > Options > Records. Click Delete Sample Database button at the bottom. Click OK. Click Yes. Restart BookTrakker. New Records: Click on "New Record" (lower right) After doing data entry, click “Done” or “Next Record” to continue. Data Entry Order is set by Tools > Options > Tab Order. Pick the fields you want, in the order you want, click Set As Startup to use each time you click New Record. F1 for Help on setting up a tab order for data entry. Tools > Options has a lot of default settings for data entry and other operations. Record mode in their respective fields on the Keywords tab. CheckIt, if installed: Click the Online button, then the green check on the Plugins button. F7 When in the Inventory Detail View, this will bring up the Add to Catalog Window. F9 Takes you to Orders. N to create a new Invoice. Ctrl-D - Duplicate Current Record. Works in Browse and New Record modes. Ctrl-K - Kill AutoEdit in current field. Will resume effect in next field. Ctrl-L - Set text to Lowercase. Ctrl-M - Disable Mc and Mac text handling. Ctrl-R - Copy data from previous Record. The Source Record will be the current Record # - 1. Ctrl-U - Set text to Uppercase. Ctrl-V - Paste text into field. Ctrl-Z - Undo text changes in a field. the record number you want to go to, then press the Enter key. For the following Status changes, you DO NOT have to Edit the record. To mark a single book Sold, type “S”, then press the Enter key. To put books On Hold, type “H”, then press the Enter key. To reset On Hold to Available, type “A”, then press the Enter key.. If your Rec # field is alphanumeric, then its a little different. You have to use the Ctrl key in front of the single letters. To mark a single book Sold, type “Ctrl-S”, then press the Enter key. To put books On Hold, type “Ctrl-H”, then press the Enter key. To reset On Hold to Available, type “Ctrl-A”, then press the Enter key. will upload as Available in the next upload. Any change of Status from Available to anything else results in the book being removed from Online Inventory. If your Record Number is alphanumeric then you must use the Ctrl key followed by the single letters. After importing data you need to set List Online to Yes if you want to be able to upload the records. 1. Click the Hit Lists tab along the left side of the Inventory screen. 3. When the Name form appears, click OK. Notice the cursor blinking in the upper left under Search Field. Click on the dropdown button v and select Status. 5. You will now be in List View, check the Red Navigational Bar at the bottom to see if your Available record count is correct. 6. Next, click the Hit Lists tab on the left again, look over to the upper right for the Action tab. Click this. 7. Select List Online from the choices on the left side. Click Execute. Confirm. Now your records are set for Online listing. Click on the Red Hit List button at the top of your screen to Exit Hit Lists. Only books with Status = Available and List Online = Yes will be added to the online databases. Books where you change the Status to something other than Available will be uploaded for removal from the services, including books On Hold. Mapping for ABE's new Condition display. 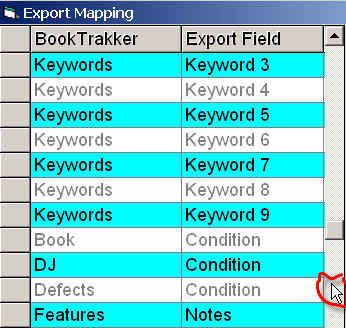 Click the scroll bar on the right side to scroll down to where you see Book/DJ/Defects mapped into Condition. Click the X at the top right corner to close and save your changes, then click the Close button on the next form. Upload All Online Inventory to ABE. You do not need to do a Purge/Replace. Importing from Fillz using a UIEE file. If your Record Numbers are alphanumeric then this method will not work. Numeric numbers only. 2. Click Export at the top. 5. Click the All Data button. 6. A file Download form will appear shortly. 10. In the window below you will see the BTPro folder. Doubleclick on it. 15. Your file will be saved in the BTPro\Transfer folder. 16. You can log off Fillz. Yes to the question about Amazon Condition. will not be duplicated if the incoming record numbers were numeric.